One normally doesnt take much pleasure in self-serious Hollywood liberal handwringers but theres no denying that Michael Clayton is pretty solid entertainment. Not for anything it does on purpose, mind you, but mostly for the spectacle of grown men in suits spouting gloriously inane dialogue while doing their strenuous best to look dramatic. 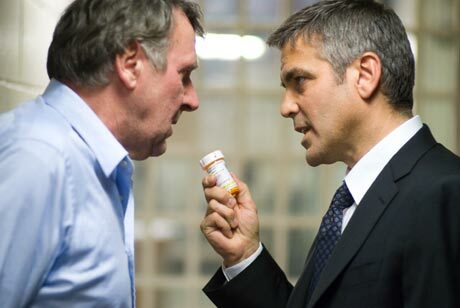 George Clooney plays the title character, a "fixer who mops up the bad deeds of Americas rich and powerful. He has the obligatory crisis of conscience when hes confronted with bipolar attorney Arthur Edens (Tom Wilkinson), who despite his instability is onto the malfeasance of a cancer-dealing multinational hes been representing. When Clayton fails to silence Edens, ice queen executive Karen Crowder moves to terminate the whistleblower with extreme prejudice. This prompts the fixer to examine his own wasted life of misdeeds and turn against his corrupt masters. Though Paul Gilroys directorial debut seems to fancy itself a political tract, the statement (poisoning people is bad) wont exactly send shockwaves through the capitalist firmament. But really, this is all about the appearance of politics, represented by a bunch of actors playing at being serious and getting a big charge out of the pomposity of it all. The participants seem so into it that their enthusiasm is touching  you dont buy any of it for a second but their devotion to make-believe transforms the grim good intentions into intoxicating silliness.